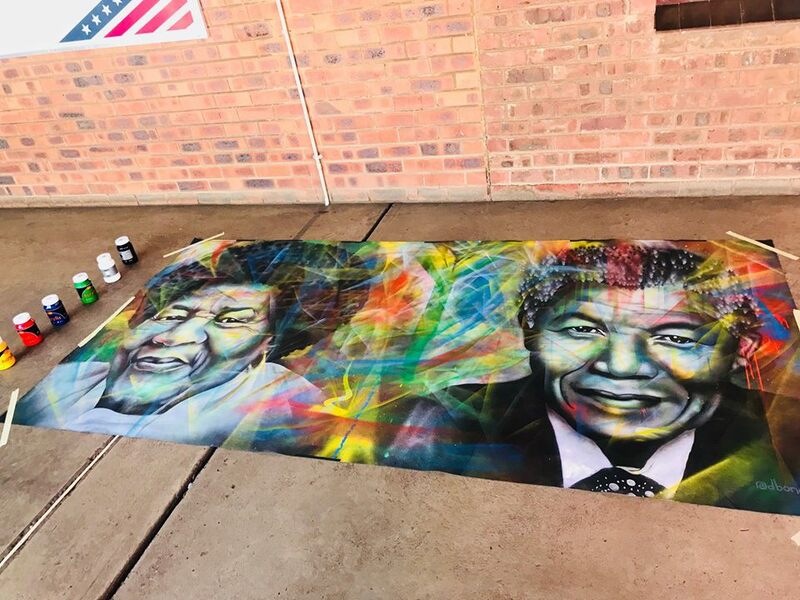 On Friday 1 December 2018, BAZ-ART was invited to create a live mural at the Dobsonville Stadium in Soweto for the commemoration of World’s Aid Day. Bongani Mhlati, better known as Dbongz was to represent BAZ-ART for the occasion. The talented South African street artists painted a live mural depicting Nelson Mandela. BAZ-ART’s prime objective and reason for being is to use art, colour and public murals to provoke thought and create awareness around issues that matter but are often too sensitive to speak about such as HIV and stigmatization in South Africa. We understand that to change the narrative around HIV and Aids there will need to be a change in the collective thought and behaviour of the nation concerning preventative measures in tackling this pandemic. The colour my HIV programme encourages the knowing of one’s status and taking responsibility of ones own health as well as that of others. It is said that the fight against HIV can only be won with the thought and behaviour of our collective conscious as a nation. BAZ-ART is pleased to be able to use art to voice provoke conversation and action on real concerns facing the nation.